The solution is simple to create in Windows 7 a calculator desktop shortcut, the Windows-7 calc.exe is a useful and very often required windows tool! The full path of the calculator in Windows-7 is "C:\Windows\System32\calc.exe" or "%Windir%\System32\calc.exe"
And now drag (right mouse button) the calc.exe to the desktop an create the calculator shortcut. (Image-1) Calculator desktop shortcut for Windows 7! 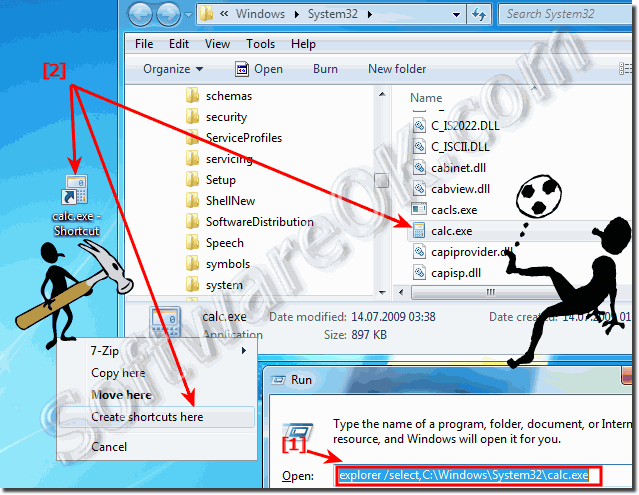 Windows-7 - FAQ-95: Windows 7 calculator desktop shortcut, how to? The solution is simple to change the user account picture in Windows 7 Please open via "Start" die "CONTROL-PANEL", and click on the Symbol "User-Accounts". The solution is simple to disable the monitor turn off power save feature in Windows 7 Simple over: » "Start" » » "Control-Panel" » » » "Pover-Options". Calculator shortcut in window 7?